This choose life or death scripture has been very important to me. I was in a life threatening situation. I was rarely sure that someone would turn up to feed me. In terms of both my physical ability to sit up, chew and swallow and with limited help available, it was hard to get enough food in my body to stay alive. I repeated this scripture about choosing life again and again and again. Gradually, my world started to change. Carers started to turn up. They then started to turn up on time. Then I got carers who adapted in a way that allowed me to talk, so that I had a better chance of asking for what I needed. My survival was becoming less precarious, but I was still in a life-threatening situation. I persisted in choosing life. Although my circumstances said this wasn’t my choice... I chose to believe that as I changed the thoughts in my mind, I was giving God access to change my world. I kept choosing life over death using this and other healing bible scriptures, and today I am happy to say that I have a life that is far safer and full of many blessings. I choose life. I choose blessings. If you have a hard life and you tell yourself that the life you have is the life God wants you to have, then be gentle on yourself, accept this thought and then practice a new thought. "I choose life". 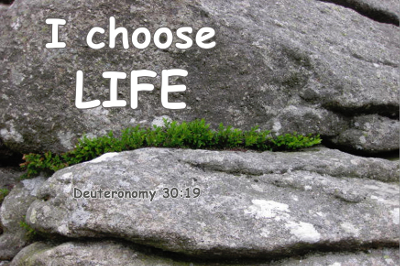 In the scripture above God asks us to choose between life and death. In Genesis, the Bible tells us that we have been given dominion over the earth. and over every creeping thing that creepeth upon the earth." I took this on Dartmoor, England. A plant manages to grow even on rock. Life finds a way. The story of Hezekiah tells us that a change in our thoughts changes our world. Over and over again we are told in the Bible that our job is to pay attention to the thoughts of lack in our mind and bring them in line with the thoughts of abundance and provision of God. A Course In Miracles tells us even more clearly to take responsibility for changing the thoughts that keep God out. Life has definitely been hard for me at times, but within those hard circumstances I have had powerful experiences of the Life of God flowing through me. The most important life is of course not the life of the body. So even if your body seems to be failing, keep choosing life not death. Keep choosing blessing not cursing. You may see changes that allow you to live a longer physical life. You may see changes that allow you to experience a richer LIFE within the life you have. As you align your thoughts with God's in this way, you are also helping to bring life and blessings to everyone. Here are some more wonderful bible verses if you have suicidal thoughts. Elijah feels like he has had enough and wants to die. He looked around, and there by his head was some bread baked over hot coals, and a jar of water. He ate and drank and then lay down again. So he got up and ate and drank. Strengthened by that food, he traveled forty days and forty nights until he reached Horeb, the mountain of God. " There may be times when you need to say to yourself "Get up and eat" - or if you are bedbound ;-) "Eat". Sometimes doing the next thing you can to stay alive is a massive achievement. Consciously choosing life and blessings is one of many spiritual and psychological self help approaches I took to live successfully with severe Chronic Fatigue Syndrome. I continue to apply these approaches today, living with illness at a less severe level. If you have suicidal thoughts, you might also want to read this wonderful article by Cindy Teevans. Sadly, her Dad committed suicide.